Based on the outgoing SLK, the SLC has a familiar design but is distinguished by a sportier front bumper, restyled headlights, and a revised grille with diamond inserts. The rear end also receives some changes as there's a new bumper, modernized taillights, and a modified dual exhaust system. Engineers have also improved the retractable roof which can be opened or closed at speeds up to 25 mph. The interior is instantly recognizable but Mercedes made some subtle changes by adding a new sports steering wheel and a revised instrument cluster. The car also features updated upholstery, revised trim, and a new COMAND infotainment system with a seven-inch display. In the United States, two engines will be available. The entry-level SLC 300 has a turbocharged 2.0-liter four-cylinder that produces 241 horsepower and 273 pound-feet of torque. It is connected to a nine-speed automatic transmission which enables the car to accelerate from 0-60 mph in 5.7 seconds before hitting a top speed of 130 mph. Moving up to the Mercedes-AMG SLC 43 rewards buyers with a biturbo 3.0-liter V6 engine with 362 hp and 384 lb-ft of torque. The model is less powerful than the outgoing SLK55 AMG but it accelerates from 0-60 mph in 4.6 seconds before hitting a limited top speed of 155 mph. 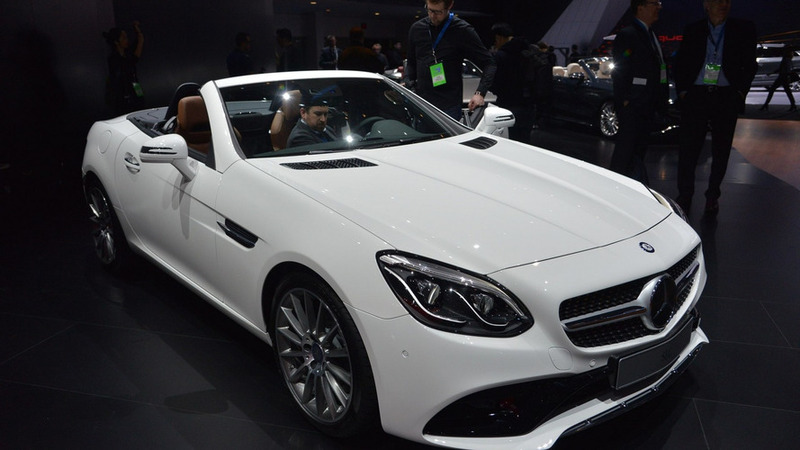 The 2017 Mercedes SLC will go on sale in the United States next spring and pricing will be announced closer to launch.